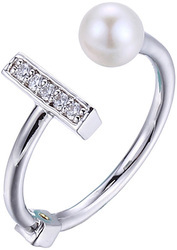 Pearl Rings On Sale - Limited Time Only! Widest Part Of Ring is 3/8 inch. Whole Sizes, 6-9. Cultured freshwater pearl measures 5.5-6mm. Rhodium plated.